Does XYZ coilovers have any warranty? How much of the mount do I need to leave threaded on the shock body to be safe when adjusting the lower mount? What is the difference between Rally Asphalt and Track Racing coilovers? How much can I drop my car with XYZ coilovers? In general, the vehicle ride height can be dropped around 120mm from OE height for most applications, and the highest setting is same as OE vehicle ride height. Is XYZ shock monotube or twin-tube design? What is inverted tube (upside-down) shock absorbers? What’s its feature? The design of inverted tube is exactly opposite to the standard shock absorbers. 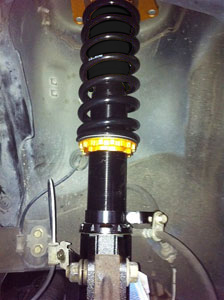 The shock body is close to top mount, and strut cylinder is close to lower mount. Inverted tube is specifically designed for McPherson shock absorbers. The principle of inverted tube is to reduce unsprung weight (the total weight of the vehicle is not supported by the suspension system). Due to thickness of the strut cylinder being stronger, the inverted tube can bring more excellent stability, durability; in addition, it can withstand high impact forces and quickly response to variations in road conditions. Do all applications have pillow ball upper mount? And camber adjustability? Most of applications come with “ Pillow ball Rubber Top Mount “ and most Mcpherson strut has camber adjustability but it still depends on car models. What’s the difference between Asphalt Rally coilovers and Gravel Rally coilovers? Should the dampening setting of left and right shocks be the same? Yes, the damping force of left and right shocks should be identical, otherwise it would cause unstable handling and uneven tyre thread wear. However, the damping force of front and rear shocks can not be always the same depending on different requirements. Do you have sole (Exclusive) agent in Russia? No, please contact us if you're interested. How to fix the brake line? Any abs or brake lines should be fixed onto rubbers supplied in the tool bag first, then attach the rubbers to the supplied brake line brackets (two types of brackets). And attach the brake line brackets to the coilover; the position of the brake line brackets is determined by the installer.